San Step - LOGIC, Inc.
WHERE DO I GET IT?!? 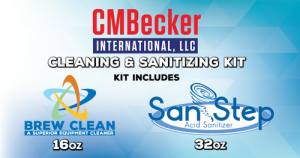 The very first EPA registered sanitizer introduced by LOGIC, Inc. – San Step was developed to solve the most common problems encountered with the leading acid/surfactant-based sanitizers. The obvious problem is the high degree of foaming, which leads to difficulty in rinsing as well as preventing those sanitizers to be used in CIP (clean-in-place) systems. The second problem, which is frequently not understood to be a problem, is that the biocidal effect is significantly impacted by the presence of water hardness. In fact, a cloudy solution of a foaming acid sanitizer is no longer capable of sanitizing. San Step is a very low foam material when used as directed so it is even suitable for systems that vigorously agitate the solution. To be sure, foam is generated, but it is very unstable and breaks down so quickly that even continued agitation will not generate a noticeable amount of foam. No foam clings to the sides of vessels or tools, leaving a pristine, sanitary surface. Water hardness has no impact on the efficacy of San Step, so you do not waste your treated water (softened, RO, etc.) on sanitation. Although a San Step solution will be cloudy if you mix a strong solution (which is certainly not necessary; stick to the dilution rate of 1 oz per 6 gallons of water for the most economical use), it will continue to perform every bit as well as it should. And, of course, the acid blend is an effective descaling agent that removes mineral deposits that will lead to beerstone.